With the kids home from school, Summer can be a tough time for parents (not to mention expensive). This post will help you start to budget for summer and get your family’s finances in shape for the season ahead! I can’t even begin to understand how we are already beginning to think about Summer, wasn’t it just Christmas like yesterday? Ready or not, here it comes. I personally LOVE summertime! With summer comes the excitement of pool parties, backyard BBQs and day trips! But summer for a mama can be difficult as you are now dealing with bored kiddos at home that you need to entertain (on top of the work, extra dishes in the sink and laundry piling up). Not to mention, summer activities that can be costly if you’re not financially prepared. Today we’re talking all about how to budget for summer and get your family’s finances in shape for summer! Lauren is with us today sharing some awesome tips and tricks for summer budgeting. Take it away, Lauren! 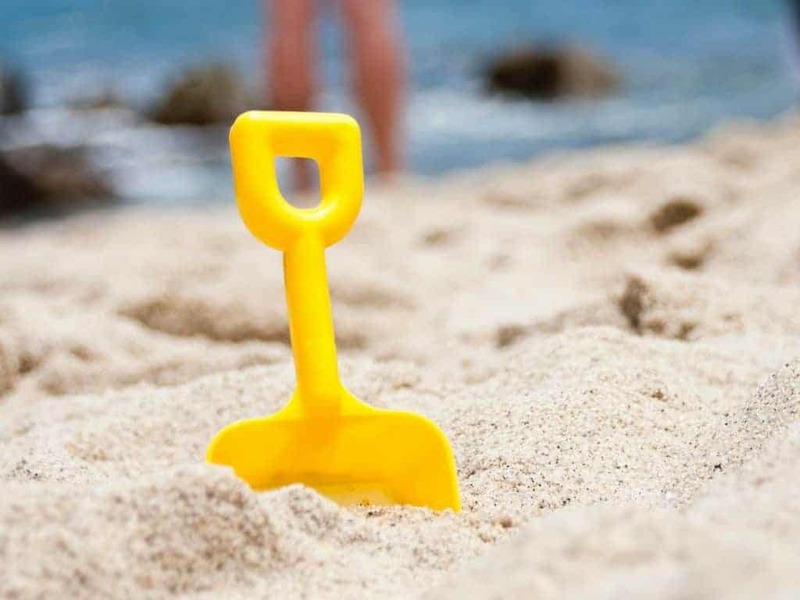 Summer is quickly approaching and this likely means that you will have some time to take off work and your children will be home for the two to three-month period. While you may have nothing in mind now, your children will need things to do throughout the summer to keep them busy, their minds creative, and prevent ultimate boredom. 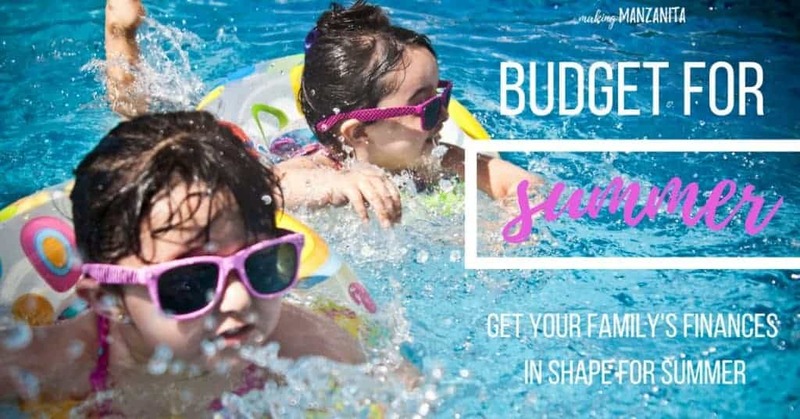 To ensure you and your children have an enjoyable summer, now would be the time to skim the fat from the family budget and really focus on your finances to ensure you can budget for summer. 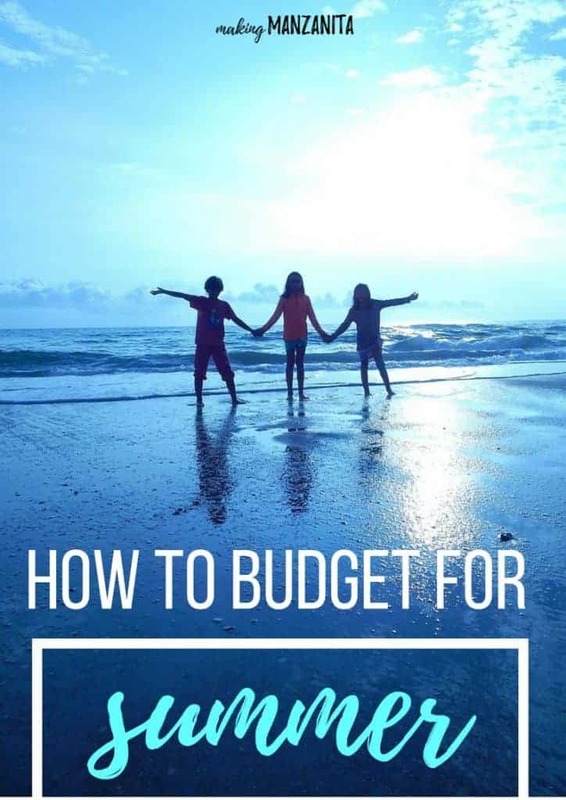 Below, we will take a look at some of the ways that you can budget wisely for an awesome summer. If you get paid every week, or every two weeks, you should set aside a small amount of cash for summer fun. This can be any amount that you feel fit for the jar. For example, if you have two children, you may determine that $20 is enough for the week – $10 per child. Make sure the amount you choose is manageable and that you are able to follow through with it every week. To help add additional change to the jar, you should consider creating a family money jar. This way, everyone can contribute to it from change to dollar bills when they have one or two to spare. The more everyone pitches in, the more money everyone has to work with. Another cool thing to try out is the 52-week savings challenge; check it out here! The nice part about your children being in school is that you may not have to worry about breakfast and lunch because they will eat at school. While your kids are out of school for summer, you will need to provide them with breakfast and lunch. This is something you may not have been used to for the last eight or nine months. This means that you need to prepare and budget for additional food for the week. While this does not seem like a BIG deal, it can be, especially if you are living paycheck to paycheck. Make sure that you sit down and figure out how to add this additional food to your budget for summer as well as figuring out how much you’ll spend on a budget. While your children are out of school, they may want to go out and have fun. If your budget for summer does not allow for a lot of spending, then you may feel like they will become bored fast in the house. Look for local, free, or low cost events that your children can go to. There may be some large family fun nights in the local neighborhood. Maybe the city or county is putting on an event where everyone is welcome. Take advantage of these options, as they will save you money and your entire family will enjoy themselves. If your children like to swim, consider investing in an inexpensive pass for them to enjoy themselves. For example, the local gym or recreational center may have a special on memberships and you can score all of your children a pass for $5 or $10 for the summer months. This will allow your children to go to the rec center and have fun while you save money. One of the reasons people spend more money than they expected on a family trip is because they do not plan it. When you fail to plan the summer activities, you end up paying more because everything is done last minute. For example, if you know you need to spend the night in a hotel, it would be wise to book it weeks or months in advance. In fact, if you do so, you can save a lot of money. Some hotels will only cost you $50 to $75 per night for a nice four-star hotel. If you wait until the night you need the hotel, you may pay upwards of $150 to $200 per night for the same room. It does pay off to plan ahead. Also, if you plan to go out with your family and spend the day out of the house, make sure that you plan your meals. You can enjoy a packed picnic, which is a great alternative to eating out. This will save you at least $20 per meal. You may think that your family funds will suffer during the summertime, but if you take time to properly budget for summer, it will not. When it comes to keeping your kids busy during this time, make sure that you have cheap alternatives to fun activities such as a stack of DVDs in the house instead of shelling out money for the movie theater. The more planning and budgeting you do now, the less likely it is that you will go over budget during the summer. Looking for more summer ideas? Create this DIY Hello Sunshine wood sign to brighten up your porch for Summer. 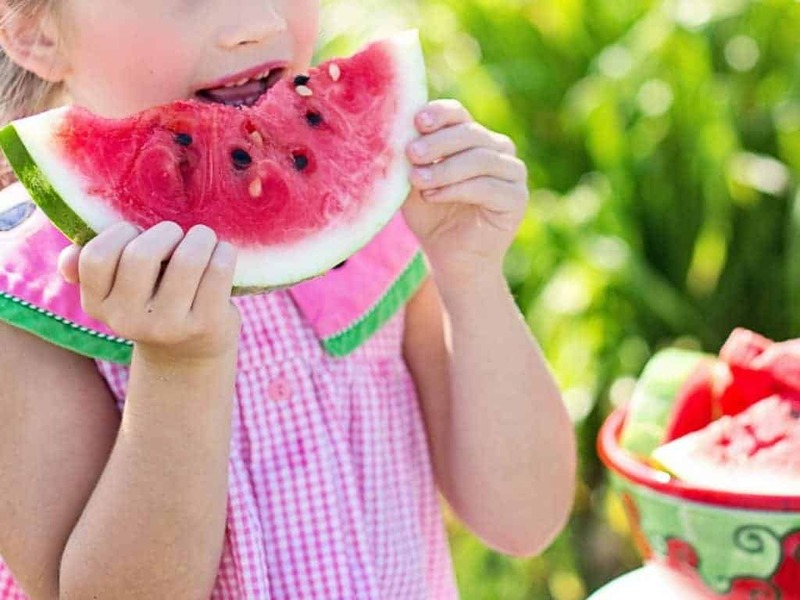 Simple summer hacks for moms from Practical Mommy will help keep you stress-free. Check out this adorable summer boredom buster jar DIY from While He Was Napping. Make your own pool noodle raft! Love this tutorial from Julie Hoag. These 200+ ways to keep kids busy this summer from Two Kids And A Coupon will definitely come in handy! I’m definitely going to make some of these frozen lemon dreams from Wit & Wander. Yummmy! I loved all that great advice about budgeting for summer from Lauren! I can’t wait to enjoy this summer. 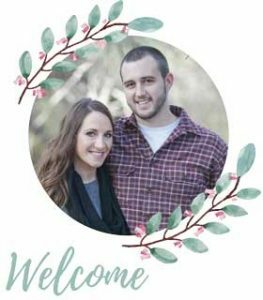 Last summer, we had a hard time getting out because we had a newborn, so we’re amped and ready to go this summer! I will definitely use these tips when thinking about our family’s finances for summer.